Handmade Detroit | Sponsor Roundup- Detroit Manufacturing! If you’ve been to any of the many festivals in Metro Detroit, you have no doubt seen the Detroit Manufacturing tent there, selling a huge assortment of Detroit –themed shirts and wearables. 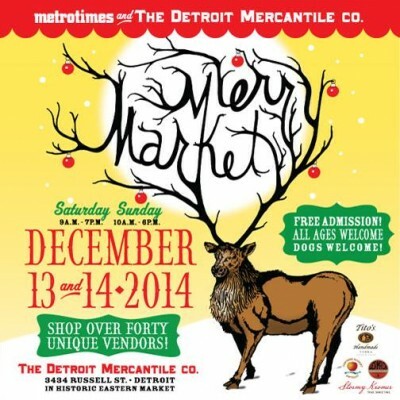 We were thrilled to once again have Detroit Manufacturing as a sponsor of Detroit Urban Craft Fair! The owner is Robert Stanzler, a fourth generation Detroiter who really, really loves Detroit.Robert also owns the Detroit Mercantile in the Eastern Market area, and it’s a great place to do some shopping for regional goods and interesting finds. This weekend the Mercantile will open up its doors to the back area of the building to host the Merry Market, a 2-day event featuring 40 local makers. The market will have beverages available, as well as an assortment of food trucks. Admission is free! Plus dogs are welcome, so how can you go wrong?